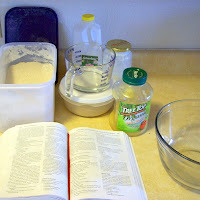 We love sourdough- I made the Sourdough Pancake recipe from Joy of Cooking before finding the whole Nourishing Traditions way of eating. I adapted the recipe to include yogurt to properly soak the flour, and whole wheat flour rather than white. It's pleasingly sour, and so easy since you mix most of it up the night before. Hubby likes waffles more than pancakes, so that's what we made. To develop the sour taste, you do have to mix it the night before and let it rest over night. 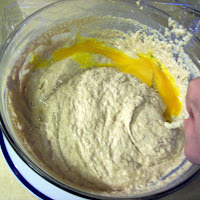 ~ put yeast in water, allow to bubble- use a large bowl for this or cut the recipe in half- it grows! Cover with plastic wrap (or a dish towel) and allow to rise. It takes a little bit of work to get the eggs mixed in, but not too bad. I just use a fork. Cook. If making pancakes, they're ready to flip when they easily can be removed from the skillet. Waffles take a little longer than white flour waffles and are done when they are a nice golden brown. 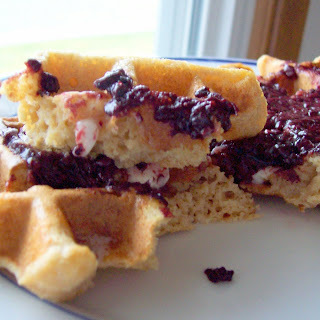 We served with boiled-down berries as a simple all-fruit jam/syrup. Light and fluffy, but with the benefits of whole grain! Any leftovers we save in the fridge and heat up in the toaster. 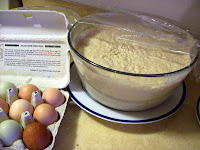 They also make great egg salad sandwiches- the deep pockets held the egg mixture really well! 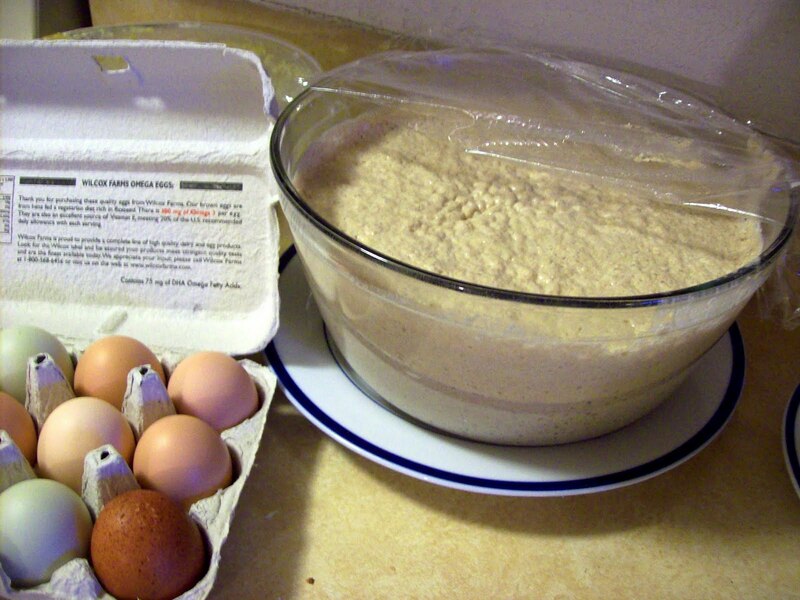 *Tip: To make them more sour, mix the batter a full 24 hours before. They get stronger the longer the mixture rests. Are you making yogurt yet? It's a huge money saver! Maple sweetened whipped cream from Donielle- wouldn't that make a great topping? 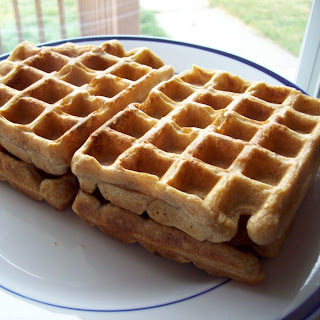 0 Response to "Soaked Wheat Sourdough Waffles- No Starter Needed"